But Lucius has never lifted a surgeon’s scalpel. And as the war rages across the winter landscape, he finds himself falling in love with the woman from whom he must learn a brutal, makeshift medicine. Then one day, an unconscious soldier is brought in from the snow, his uniform stuffed with strange drawings. He seems beyond rescue until Lucius makes a fateful decision that will change the lives of doctor, patient, and nurse forever. I want to say I don’t understand why this book has so many positive reviews, but unfortunately I really do understand the appeal. A WWI love story between a doctor and a nurse? With a non-British focus? And exploring the medical perceptions of PTSD at the time? It’s everything I could want out of a historical fiction. But right from the start, something about The Winter Soldier just didn’t sit right with me. Lucius may be a sympathetic protagonist, but that’s really all he has going for him. I felt sorry for him – that’s it. There was little weight to his experiences, and I felt like I was simply watching him go through the motions. 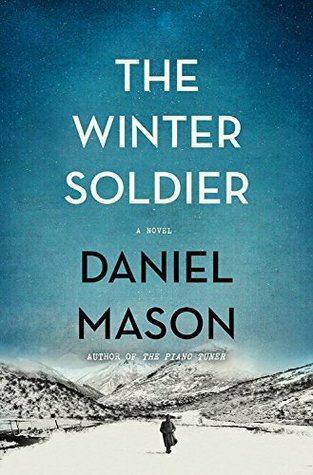 If anything, it seemed like his life had been leeched of any emotional depth or significance; if Mason was looking to portray him as detached, he only succeeded in making his protagonist robotic and devoid of humanity. Reading the novel is a lot like reading somebody else’s to-do list. The lack of Lucius’s emotional investment in his own life only translates to a flat, unmotivated plot that moves through several points that might be interesting if only the protagonist or the writer seemed to care about them. When Lucius enlists as a doctor and his recruitment is delayed for several months, there is no sense of frustration or anticipation for what is to come – it’s a description of what each stumbling block entails rather than the character’s response to it. The same can be said of his actions when he does finally arrive at the hospital, and the plot becomes a list of each chore he needs to perform. Even his relationship with Margarete – which should arguably be the emotional core of the plot – is devoid of any romance, any intrigue. Things happen, but nothing is ever experienced. As a rather predictable result, I felt nothing for Lucius as the novel moved through its final act. In all honesty, I spent the final 150 pages bored out of my mind and frustrated beyond belief. The cherry on top of my suffering sundae was the so-called “twist” at the novel’s climax, which – again – held no weight and only served to irritate me further. Sorry to anyone that enjoyed this novel, but I couldn’t be bothered with it. I think I’d have enjoyed it more if I’d put it down about 40 pages in and then never thought about it again. Recommended to: People that enjoy going to the dentist.